Here's one more double embossed card. I made this one into a 4 1/4 x 4 1/4 card for a little something different. It's a nice size for a little gift card, and I like the way the oval frame is such a focal point on the smaller sized card. How's this for a cheery get well card? This isn't double embossing like I have been posting a lot of lately, but it starts the same way. Attach chipboard with an oval cut out to the back of an embossing folder. The section with chipboard on the back will emboss, but the center oval will remain smooth. Then you can stamp away! What haven't I embossed you ask? Not much! This was a Cherry Coca Cola can which looks great with Rich Razzleberry card stock! I cut the flowers first and ran each one through the Big Shot individually in an embossing folder just like I would card stock and it turned out great! Here's another card with embossed fabric. It was a fun card to have on my display board because people didn't realize the pink was fabric at first. I attached it to Whisper White card stock with an adhesive sheet before running it through the Big Shot. I think the color combination is what I like most about this card though. I love all of the polka-dotted backgrounds I see on other people's cards. I find that I sometimes am not the best with "random". But this one worked for me because the center circle has to be in the center and the rest of the dots are "random". The cupcake is the only thing not polka-dotted and it's popped up with a Dimensional. I revisited a card I did a couple of years ago for this wedding card. It's a gate fold, opening in the middle, but it's a little hard to see on the black card stock. I used Shimmery White card stock and embossed it to "fancy" up the wedding dress. Here's a fun way to use fabric on your cards. I used an adhesive sheet to attach it to Whisper White card stock before running it through the Big Shot. Think of the possibilities! Here's another of my double embossing samples, and it happens to be one of my favorites. I love the Pool Party/Whisper White combination, and when I made this card with the little frame, I was hoping the vase would fit. Each month I try to do some sort of interesting fold with my stamp club. Last month we did this wiper card with the Mouthwatering stamp set and now retired In Colors. I have to say this is one of my favorite cards, and it was about the time that I made this that one of my stamping friends turned 50. So I made her a card with a "50" on the pop-up wiper piece. We also used the scented embossing powder on the popsicles which makes them shiny and smelly in real life. Here is a wiper card I did a couple of years ago. This new catalog is full of great new products you just have to see for yourself! 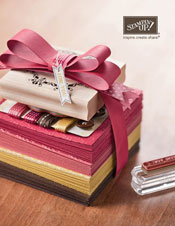 If you don't have a demonstrator, I would be happy to make arrangements to get a new catalog to you.